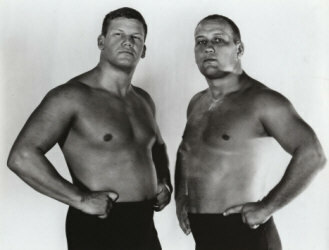 In late 1965 or early 1966, Lars Anderson entered the Carolina/Virginia area (Jim Crockett Promotions) to join his brother Gene and they formed the tag team of the Minnesota Wrecking Crew. This time period is represented by the photos on this page of the Andersons wearing the long black trunks and the black boots. 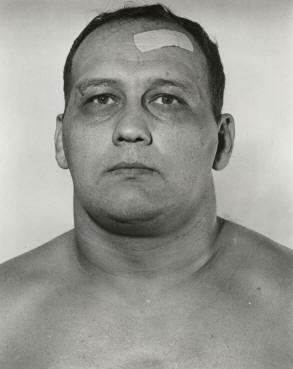 During this first stint as a team, they wrestled in mostly mid-card matches. 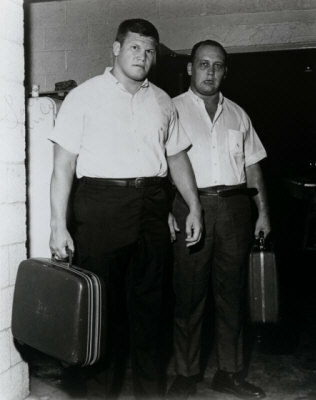 In June of 1966, Gene and Lars left for Georgia and rose to the top of the cards there, winning the Southern Tag Team titles in early 1967, and then winning the World Tag team title trophy recognized by the Georgia promotion in April of 1967 from Enrique and Ramon Torres in Atlanta. 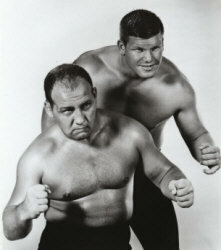 Later in 1967, they either lost or vacated those titles and returned to Crockett Promotions and were at the top of the cards, eventually winning the Southern Tag Titles from Johnny Weaver and George Becker in 1968, shortly before that title was discontinued. 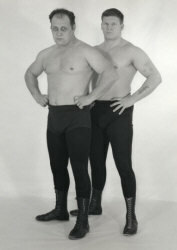 When Gene and Lars returned from their highly successful tour of Georgia, Lars told WGHP (High Point NC) television wrestling announcer Charlie Harville all about how he and Gene had won the World Tag Team Championship in Georgia, and held up a photo of the two of them standing with the the trophy. 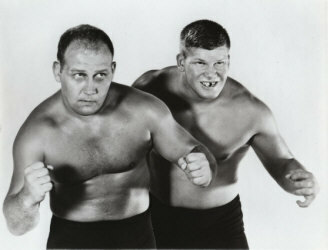 This helped establish the Anderson brothers as a top tag team in the area. Something else had changed, too. 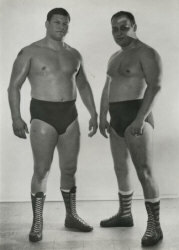 Lars and Gene now wore the familiar short maroon trunks and the maroon and gold boots that became synonymous with the Anderson family through the years. Gene and Ole wore those signature boots the rest of their careers. Ric Flair, a cousin of the Andersons in wrestling lore, wore those same style boots on occasion early in his career, and Arn Anderson did as well briefly when he and Ole formed a tag team when Arn first entered Jim Crockett promotions in 1985. Flash forward to Friday night, June 24, 2005. Gene's son Brad is standing in the locker room getting ready for a match at an EWA wrestling show in Mooresville, NC. He had brought us some photos from his Dad's personal photo collection, many of which you will see on this page. Before Brad had a chance to show us all the photos, my friend Carroll Hall was relaying the story above of how Gene and Lars showed the photo with the World Tag Team trophy on WGHP television with the trophy on a stool. Brad's eyes got real wide. He started digging through his bag and pulled out that very photo (see above.) 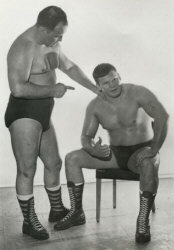 Carroll had not seen that photo of Gene Anderson in nearly 40 years, but he still remembered it well enough for Gene's son to immediately know what he was talking about. It was a cool moment. Enjoy these rare photos of the earliest incarnation of the Minnesota Wrecking Crew. 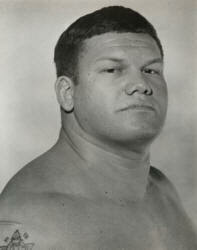 Thanks to Carroll Hall of Wrestling Memories for his substantial assistance with this article. Special thanks to Brad Anderson for these photos from the Anderson family archives.